Gain God T.S.Ci, God Z.Yun and Spinel Bag in This Event! The Brand-new Box Slot Machine will be coming! More different resources are waiting for you! Easy and Worthy! This time, God T.S.Ci, God Z.Yun and Spinel Bag which are waiting for your coming. Also, there are the hero’s arm pieces in here which can strengthen your power. You can randomly get one of them at the price of 200 gold per ticket, which can improve and enhance your hero strength. 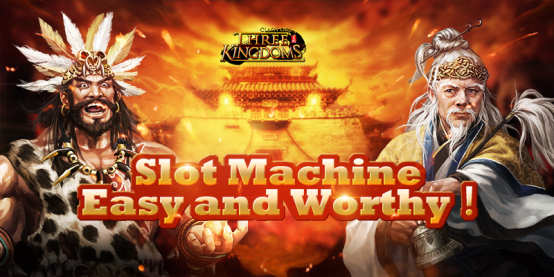 so what are you waiting for , hurry up to join our the wonderful slot machine event! Come on! During the event time, player above Lv. 70 will get one ticket every time spending 200G. 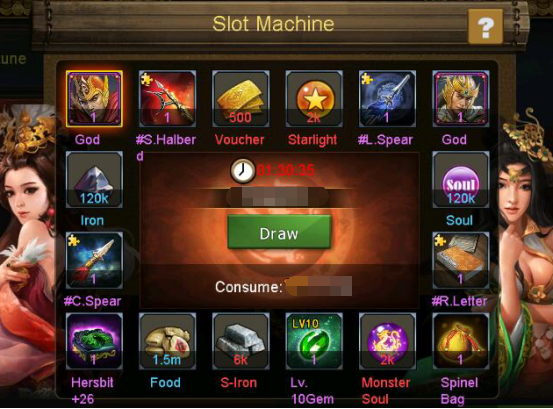 The ticket can be used in Slot Machine to draw and win the corresponding rewards. Please click to claim before start the next draw. Ticket - When you consumed 200G, one ticket will be sent to you automatically. Draw - Use one ticket to spin once. Claim - Claim the corresponding rewards. 1. Free chances will be given to players at 00:00(GMT+8) a.m. every day. Free chance will be consumed prior to tickets. 3. Tickets are sent to your account automatically. When the event ends, each unused ticket will be converted into 300K Food and added to your account. 4. When event ends, unclaimed reward will be converted into 300K food and sent to you.